Choreographer and filmmaker Farah Khan is also known for her great sense of humor. 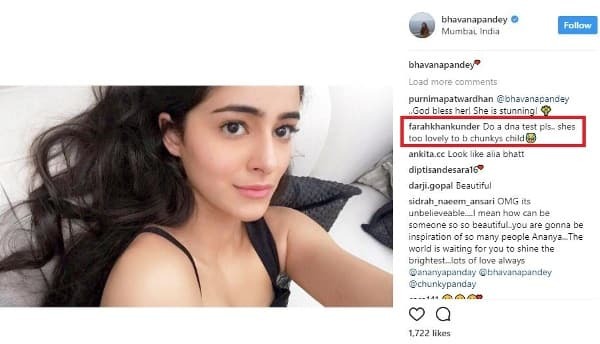 Recently, Chunky Pandey’s wife Bhavna Pandey shared a picture of her daughter in a black outfit on Instagram and captioned it with a heart. Farah Khan commented on the picture with a laughter emoji. She wrote: “Do a DNA test pls.. shes too lovely to b chunkys child”. Pandeys are very good friends with the Khans and we’re sure that they took it as a compliment. If rumors are to be believed, Ananya will make her Bollywood debut with Karan Johar’s Student Of The Year 2. But, according to some other sources, she will be launched by Salman Khan. In June, in an interview with Hindustan Times, Chunky said that he would love to be known as Ananya Pandey’s father. Ananya had told Chunky that “she wants to get into films.” As Ananya has already finished her studies, she is doing everything right to make her debut successful. From fitness coaching to dance classes, Ananya is preparing really hard.